Assessing the talent: There’s plenty written about him already. Really nothing I can say that hasn’t. He can make all the throws already: on the run, under center, shotgun, slants, long ball and all kinds of screens. His film is a thing of beauty. His motion and technique are fluent. In 27 games as a sophomore and junior, he has over 6,000 yards passing, throwing virtually 1,000 more as a sophomore. He already has over 80 touchdown passes, including 58 as a sophomore. His completion percentage is over 65% and has less than 10 interceptions in each of his years leading Oaks Christian. "DJR313:What about Jimmy Claussen? I saw a special on ESPN Outside the Lines and they said he will be the Lebron James of Football, as far as hyped prodigies go. He said he has been offered by several top schools, I was just curious if Nebraska was looking his way." Odds of becoming a Cornhusker: 0% Who knows??? He is about a sure thing to a USC lock as there is. I don't think he likes the way his brother has been yoyoed at Tenn. The ESPN thing said Notre Dame was his favorite at the moment, but he is a Southern Cal kid. NU QB target for 2007 Ryan Mallett took a trip to the cotton bowl as a guest of the Longhorns to watch the red river shootout. Texas is amoung one of the many schools vying for his services. Other schools currently interested in him include Arkansas, Texas A&M, Michigan, Miami, Oklahoma, USC, Florida, Florida St, Cal, and UCLA just to name a few. Nebraska is the only team to have offered him a scholarship so far. What about Jimmy Claussen? I saw a special on ESPN Outside the Lines and they said he will be the Lebron James of Football, as far as hyped prodigies go. He said he has been offered by several top schools, I was just curious if Nebraska was looking his way. Let me put it this way. Jimmy Clausen is a freak of nature frame wise and talent wise. You are right though about his reputation. This guy is going to be a MONSTER player in college and he is going to be a household name for anyone and everyone who watches college football. This guy will end up winning a Hiesman and you can quote me on that. 14-0 record, 58 touchdowns and 3700 yards throwing is impressive, but get this. Those are his Soph stats. Oh and get this. Claussen has put up more touchdowns in his Sophmore year then Steve Young and Jim McMahon did in their junior and senior years combined. Claussen could even pass up the most unbelieveable high school football QB of all time Tim Couch. Couch when he left high school had thrown 133 TD passes, 12,100 yards, completed 872 passes, and had a completion percentage of 75%. Now that i have basically spoken about his freankess on the field, lets talk recruiting. Both Casey and Ricky Claussen (Jimmy's older brothers) played at Tennessee and Casey Claussen is a GA at Mississippi St. All the power house schools (Florida St, USC, Oklahoma, Notre Dame, Michigan, LSU, Tennessee, Ohio St, Florida, Miami, Cal, UCLA...etc) have offered him and he's already at 30 offers right now. I won't even try to say Nebraska has a chance with him right now because he really isn't looking at recruiting, so it would be speculation on my part if i did. more to come...let the Clausen sweepstakes begin! This kid has piles of offers already. Dozens.. I dont think that NU has a chance of landing this guy but it is nice to dream. do you think that this guy will live up to the hype. I remember when Eli Manning was in high school he was supposed to be better than Peyton but that didnt happen in college and it will never happen in the pro's. I did watch him on outside the lines on ESPN and this kid does look good check that GREAT. I think that recruiting battle might end up looking like the the one on the movie "Johnny Be Good" some college might just get into trouble over this kid. and that's how i'd put it to the kid: zac will be going on to better things, beck will be (from all signs, mind you) the starter and we're gonna need a general-in-training. and if clausen is as good as everyone says, he could have every chance in the world to get the top job to boot. i've seen the future: it's looks sweet, and i'm from the outside looking in. imagine what it could look to a kid when a coach with fire like callahan or blake gets a moment to present the program? our biggest downfall might be that we dont have a ex-QB as a QB coach. nothing against Norvell but i have always had a problem with that. how can an ex-tightend tell a QB his mechanics are wrong or whatever. a guy like Clausen, if he is as good as predicted whouldnt need that much coaching in that aspect. but he may be looking for a school that has all of the coaching to get him to the next level. There have been plenty of what people call "good coaches" who have never played a down let alone the position that they coach. Charlie Weiss never played football AFAIK. As much as Norvell could know, your right. Kids will look at things so many different ways. I believe he was a WR's coach with Indy. Clausen is going to be tough to pull regardless of the coach. JMHO, I would focus more on guys like Phillip Bates, Ryan Mallet and LaTravis Washington for our QB in next years class. Washington and Bates are two very realistics choices with Mallet being a bit behind that. Mallet will probably end up at Arkansas or Texas, IMO. Also, Washington and Bates would be huge gets for their versatility. If Washington were to flame out at QB, he could play anywhere from WR, CB, S or even OLB due to his strength and build. Bates could likely play WR, S and maybe some CB. That's the great thing about recruiting versatile QB's. His throws are right on the money. Also pay attention to his footwork. this guy is a freak of nature, he is definitly ahead of every one, and is a lot better now, then his brothers ever were or ever will be. he is one kid, that if the nfl allowed it, could possibly play at that level right out of high school. I wouldn't go that far. One hit from an NFL linebacker and he'd probably never want to pick up a football again. Pretty good at hitting guys in stride so they get YAC. and that is why the NFL wont ever allow it. i meant mentally and pure skills, but he is in a 16-17 year old body and physically would not be able to handle something like that. hell i am 40 and if i got hit by an NFL linebacker i dont think that i would see 41. No more Clausens: There won't be a third Clausen playing quarterback at Tennessee. Jim Clausen was in Knoxville yesterday and informed the Tennessee coaches that his youngest son, Jimmy, was no longer considering the Vols. Jimmy, one of the most coveted junior prospects in the country, is expected to publicly commit to Notre Dame soon. His two older brothers, Casey and Rick, both played quarterback at Tennessee. Rick is a graduate assistant on the Vols' staff. The Vols had been recruiting Jimmy, but it was a long shot that they would get him. The Westlake Village, Calif., prospect was also being recruited by Southern Cal, Michigan, LSU, South Carolina and Oklahoma. ESPN is reporting that he will verbally commit to Notre Dame tomorrow. :spooners And Notre Dame too! He Committed today to notre dame the LA Times website has a story on it. it is a long time until signing day, so you never know. Nah, Clausen is a darn fine QB, however I don't believe he is the best QB in this crop of QB's. After watching highlight tapes, I personally believe Willy Korn (Clemson commit) is the better of the two. JMO. He's a pretty good QB but the stat's are decieving, Just like Marlon Lucky did he plays out in the Valley - The teams in the valley are the WEAK High School Conferences in Los Angeles - The teams in Orange County,LA City, and South Bay Conferences beat the sh#t out of the Valley teams year in and out. He also goes to a Christian / Private school that recruits so that helps him alot. Don't get me wrong he's one of the better QB's in the nation but I think there's probally brtter in TX, FL, and CA. He wouldn't fit in at NEBRASKA anyway he's pretty ARROGANT from what I've seen on the HS SPORTS shows on the local tv stations. Tell me this isn't hilarious! Saw it on a guys sig on another site so I had to share. Cracks me up. 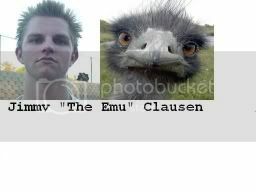 Rearrange the letters of his name Jimmy Clausen and you get "JC is manly emu"
Now that is just not fair! !